Poet, lyricist and litterateur Prof Idrish Ali speaking on the occasion at Tangla on Friday. The Citizenship (Amendment) Bill (CAB), 2016 is contrary to the basic tenets of the constitution and it is “an effort for pushing the Assamese community into the verge of extinction”. This was observed by senior advocate Kamal Nayan Choudhury who attended as appointed speaker at a memorial lecture on the topic, ‘Foreigner problem of Assam: A Perspective’ held at Tangla of Udalguri district. Commemorating the 34th death anniversary of Ramesh Chandra Saharia, the memorial lecture was held at R.C Sahariah Teachers’ Training College, Tangla in Udalguri district on Friday. Ramesh Chandra Saharia was a well-known philanthropist, educationist and politician from undivided Darrang district. He served the Tangla High School as its headmaster for fourteen years till his entry into the State Legislative Assembly as an MLA from Panery LAC in 1972. During this period, he devoted much of his time to spread education and did social service in the educationally backward tribal areas of Tangla. He also served as the Home minister of Assam. He further said that there are loopholes in the law for passing the Bill and hence the people should fight against the Bill in the court of law. Advocate Choudhury while lashing out at the government observed that there can be no logic of bringing such law in a secular nation like India and it is just a political game of the saffron party. The programme, anchored by principal of R.C Sahariah Teachers Training College, Upendra Nararyan Singh, witnessed welcome address by former Paneri MLA and chairman of R.C Sahariah Educational Trust, Mridula Sahariah. Sahariah in her speech recalled the contributions of her late husband and his vision of building educational institutions while explaining present activities of Ramesh Saharia Memorial Education Trust. 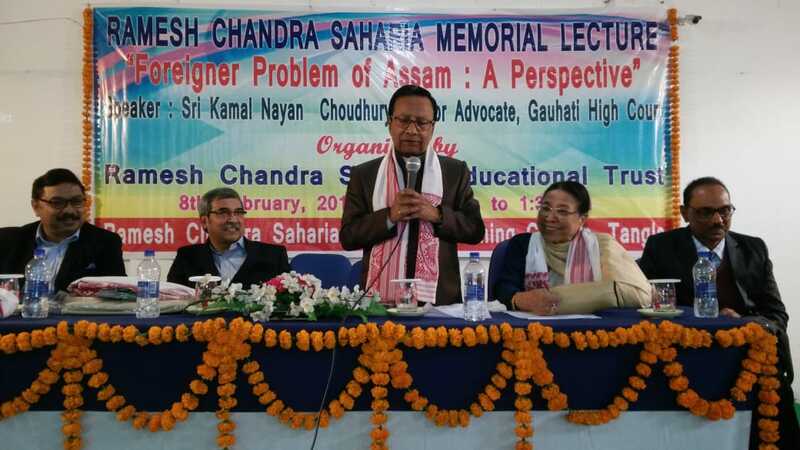 The programme, organised by Ramesh Chandra Saharia Memorial Committee and Education Trust, was attended by litterateur Idrish Ali, social worker Dr. Dipankar Sahariah, bureaucrat Ashok Kumar Barman, president of the Udalguri chapter of Congress, Brishti Basumatari among a host of students.